1st Domains Review 2019: Is 1st Domains a Good Hosting? 1st Domains is a New Zealand-based company supporting over 100,000 websites worldwide. It offers unlimited single-domain hosting with robust features and free SSL certificates. 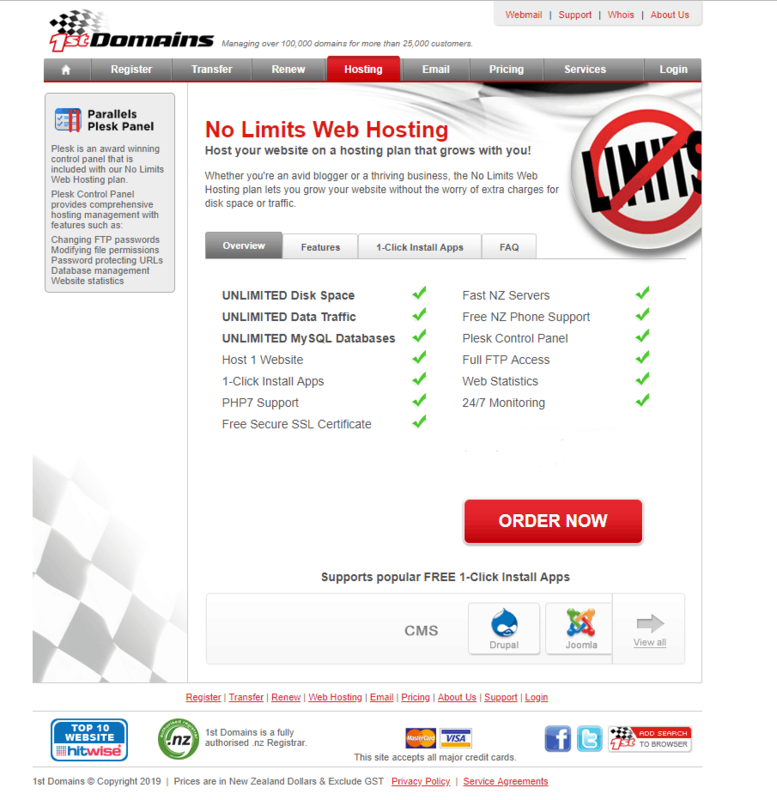 Since 2003, 1st Domains has been one of New Zealand’s top domain registrars and web hosting providers. It presently serves over 25,000 customers with over 100,000 websites. While the company only has servers in New Zealand, it’s built a solid reputation with its flat-rate unlimited web hosting plan and reliable customer support. There are a few things that make this provider stand out over the others. First, it offers free Let’s Encrypt SSL certificates, saving you money on your hosting. Next, this service supports both cron jobs and custom scripts. Note that PHP is the only scripting language the platform supports, but you can run your own scripts. Finally, customer service confirmed with me that there are no restrictions on database sizing. If you’re a business needing large databases, such as for customer records or inventory, this host can support it. This host is also suitable for beginners and experienced webmasters alike. For beginners, you have access to the SimpleScripts auto-installer for applications such as WordPress, Joomla, and more. For those with a bit more experience, you have access to Plesk for your control panel, and you have FTP access for uploads. One thing to note, however: 1st Domains does not support subdomains, domain aliases, or advanced SSL certificates. This means that if you need a greater level of security or you plan on creating separate sections on your website via subdomains, you’ll have to look elsewhere. Since there’s only one plan available for shared hosting with 1st Domains, pricing is straightforward. That said, while it offers flat-rate pricing and claims a low monthly rate, don’t let that fool you. The only option available for this service is annual. Also, there are a couple of extra fees you’ll incur with this service. If you don’t have your own domain, you’ll have to pay for it, and domain registration fees here are expensive compared to other services. If you need email hosting, that’s also going to cost you. Adding a domain and a single email hosting account will increase your costs by about 50%. Customer support at 1st Domains is solid. It offers email support, phone support, and video chat via Skype. In addition, the company has a searchable knowledge base that covers many basic and a few intermediate topics. Note that with 1st Domains, support is only available Monday through Friday from 8 am to 6 pm NZDT. 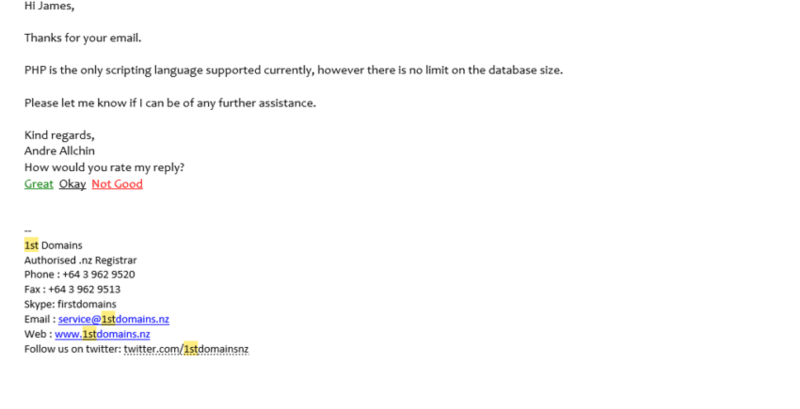 I contacted support via email to inquire on database sizing. I received an auto-response in just a few minutes, but I didn’t hear back from an agent for another 24 hours. That said, when the support agent did get back to me, he was very helpful in his reply. One thing I like about 1st Domains’ support is that it offers remote support via the TeamViewer software. That way, the agent can see the exact issue you’re having and even take control of your computer to fix the problem. I would like to see 24-hour support and some form of live chat support other than Skype, but overall the company offers solid support. Combining flat-rate pricing and solid features, 1st Domains is an excellent choice for those looking for single-domain hosting. While features such as email hosting will incur additional fees, this service offers excellent features for the price you’re paying. Get solid flat-rate hosting from 1st Domains. Wondering how 1st Domains stacks up against other Web Hosting companies? Enter any other Web Hosting company and we will give you a side-by-side comparison.